Which Scalp Conditions Are Contagious? » Which Scalp Conditions Are Contagious? Taking care of your scalp is very important for your general health. Many people put a great deal of effort into caring for their hair, and the skin on the rest of their bodies. But scalp care is often neglected – and it can lead to a range of painful scalp conditions. There are many infections and other conditions that can affect the scalp. These include a dry scalp, dandruff, scalp psoriasis, head lice and tinea capitis – a form of ringworm. Some of these conditions are chronic, while others develop because of poor scalp care. A small number of these conditions are contagious and can be caught through contact with another. In this guide, we’re going to examine some of the most common scalp conditions and explain whether they’re contagious. We’ll also discuss some of the most effective treatments. If you struggle with scalp problems and would like to know what is causing them, read on. We’re about to dig deep into the world of contagious scalp conditions and help give you the tools to fight back against these unpleasant issues. What Are The Most Common Scalp Conditions? There is a range of issues that can affect the skin on your scalp. Some are caused by external factors, like bacteria and fungus. Some are related to chronic illnesses which may need medication to treat. There are also a small number of contagious scalp conditions which can affect you. Most people will experience at least one of these conditions at some point in their lives. But which ones are contagious? Having a dry scalp can be enormously uncomfortable. It can cause your entire head to feel tight and uncomfortable, and it may cause itching and irritation. In some cases, persistent itching may cause tiny white flakes to fall – not to be confused with dandruff, which is a separate condition. Fortunately, having a dry scalp is not contagious. The most common cause of this condition is the weather and poor scalp care. Dry winter weather combined with air conditioning and dry heating can cause the skin on the scalp to become dry. The same goes during the summer if you’ve caught sunburn on your scalp. Washing your hair every day can also cause a dry scalp. Using shampoo every day (especially one with artificial ingredients) can strip away your scalp’s natural oils, leaving it dry and uncomfortable. Dandruff occurs when there’s a build-up of dead skin, which flakes and sheds from the scalp. According to dermatologists, dandruff can be a condition on its own, as well as a symptom of other conditions like scalp eczema. Treating dandruff is fairly straightforward. There are plenty of over-the-counter products you can buy to combat the problem, including Nizoral shampoo. They contain zinc, selenium sulfide or coal tar. Natural solutions to dandruff also include tea tree oil, lemon juice, and apple cider vinegar. If you’re not having any success treating dandruff, speak with a doctor to check there’s no deeper underlying cause. Here are the differences between dry scalp and dandruff. Psoriasis is a chronic skin condition that is thought to affect up to 3% of people. The condition causes scaly, red patches to appear on the skin, which can be extremely distressing for sufferers. If patches appear on the arms, legs or face, it can be very embarrassing – not to mention the patches are often itchy and irritating. Most psoriasis sufferers experience the scaly patches on their bodies, but a small number experience it on their scalps too. There’s an even smaller number of people who suffer from scalp psoriasis only, without any other patches appearing on their bodies. Being a chronic condition, psoriasis is not contagious in any way. Though the patches can look a lot like skin infections, you can’t catch psoriasis by coming into contact with it. Experts still aren’t entirely sure about what causes psoriasis in the first place, but it’s thought to be connected to the immune system. There are plenty of shampoos for psoriasis available. Some swear by medicated creams which are applied topically to the affected area. Others use home remedies, especially soothing baths. Bathing your scalp in an Epsom salt bath, or an oatmeal bath can have a positive effect on psoriasis. Many people also claim that cutting out specific food groups or ingredients (such as gluten, dairy, and meat) can help reduce flare-ups. Seborrheic dermatitis is a severe version of dandruff. Also known as seborrhea, it can involve the textbook flaky, dry scalp that many people with dandruff are familiar with. It can also cause an itchy, red rash that is painful and irritating. Some forms of dandruff can occur because of poor scalp care – but seborrheic dermatitis is not caused by low hygiene standards. Fortunately, it’s also not contagious. But doctors are still uncertain about the cause of seborrheic dermatitis. Stress levels. People with high levels of stress are more likely to experience seborrheic dermatitis. Cold, dry weather – just like the weather that causes dandruff. The side-effects of medical conditions or medications. People with seborrheic dermatitis will usually experience lulls and flare-ups throughout their lives. It will often fade away on its own, as it’s not an infection. Over-the-counter shampoos can also help clear up outbreaks and reduce the irritating symptoms. Ringworm of the scalp, also known as tinea capitis, is not a worm at all. It’s a type of fungal infection caused by fungi called dermatophytes. Fungus thrives in warm, damp conditions – and unfortunately, the scalp often provides the perfect environment for these infections to flourish. Unfortunately, tinea capitis is contagious. It’s one of the few scalp conditions that is contagious and can be passed on from person to person. It’s most common in children, especially in their school days when they’re in proximity to others. It also spreads quickly within families, because of shared hair accessories, bedding or towels. If one person in a household catches tinea capitis, it’s recommended that all family members seek treatment just in case. If you have tinea capitis, the first thing you’ll notice is an itchy patch (or multiple patches) on your scalp. These areas can be scaly, irritated and may even shed dry skin like dandruff. 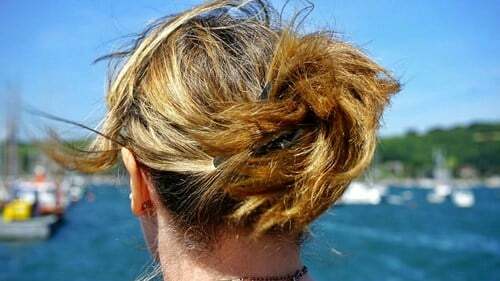 The hair may also break off around the infection – you might be able to see black dots where the hair used to be. Because tinea capitis is an infection, it can also cause many of the signs and symptoms you associate with one. As your body responds to the fungal infection, you might experience swollen lymph nodes, a low-grade fever and a general feeling of being under-the-weather. It’s vital that tinea capitis is treated as soon as possible. If left without treatment, the infection can spread across the scalp. Permanent bald spots and scarring are also a possibility if you don’t seek treatment fast. There are a few main treatment options for tinea capitis – some of which you can obtain yourself, others you’ll need a doctor’s prescription for. The most critical step in the treatment process is having a doctor prescribe an antifungal medicine for you. The two primary antifungal medicines suitable for this condition are griseofulvin and terbinafine, but fluconazole and itraconazole are also commonly prescribed. You can also help to speed up the treatment process yourself by investing in antifungal creams and shampoos. These won’t clear up the fungus entirely, but they’ll certainly help. The shampoo will clear the fungus from the scalp and help prevent it from spreading further while it’s being treated. Selenium shampoo, ketoconazole shampoo, and terbinafine cream are all recommended are antifungal treatments for tinea capitis. The less fungus is left on the scalp, the harder it is to pass on the infection to another person. Thoroughly disinfecting all combs, brushes, towels, bedding, hats and other accessories used by the infected party. This is especially important in a family setting where the infection could spread quickly. Avoid sharing towels for a minimum of four weeks. You don’t necessarily need to stay off work or keep children off school to avoid spreading the infection. If you’re the infected party, just keep your head away from others. If your child has tinea capitis, have a word with their teacher and ask them to keep an eye on them throughout the day. Be patient. Ringworm doesn’t heal overnight, and the scalp is a notoriously tricky area to treat. Take all medication as directed by your doctor. If you’re concerned that the infection is not healing, see your physician as soon as possible. Some people experience folliculitis on their scalps. This is usually as a result of shaving the scalp, or because of friction caused by headwear. Folliculitis is a condition where the hair follicles become inflamed and uncomfortable. They will often swell and itch, causing discomfort for the sufferer. Unfortunately, these inflamed follicles are at much higher risk of succumbing to infection. Staphylococcus (most commonly known as a staph infection) can get into the follicles, causing pustules to form. These are highly unpleasant, unsightly and often painful. Folliculitis itself isn’t contagious – but the infections that can get into these inflamed follicles are. If you think you might have folliculitis on your scalp, see a doctor. It can cause permanent hair loss if not treated promptly. Staph infections can also occur in the aftermath of head trauma or an injury to the scalp. It doesn’t need to be a significant injury – even a tiny scratch can provide an entry point for a staph infection. Staph needs to be treated immediately, or it can become incredibly serious. If you notice any unusual itching, pain or tenderness on your head, ask a friend or family member to take a look at the site. An infection on your scalp is likely to be oozing or scabbed, with a yellow or green-tinged appearance. If you notice any of these symptoms, contact your doctor immediately. Thankfully, treatment for staph infections is relatively straightforward, as long as they’re caught early. Your doctor will provide a course of antibiotics, which will rid your body of the infection. Hygiene is essential while recovering from a staph infection – these infections are contagious, and the last thing you want to do is infect another individual because of poor hygiene. Unlike ringworm, which isn’t a worm, head lice are lice. They are tiny insects which live on the scalp and in the hair. The lice themselves are quite harmless – the biggest problem is the irritation they cause when moving across the scalp. Head lice are very common among children – but adults can catch them too if they’re not careful. Head lice, as you may have guessed, are very contagious. They spread as a result of direct head-to-head contact, climbing from one person’s scalp or hair to another. You can’t catch head lice any other way. They can’t fly or jump, and they will die within around 12 hours if detached from the hair or scalp. There are many misconceptions about head lice. Some believe that they prefer dirty hair, while others assert that they only live on clean scalps. The truth is that they don’t have a preference, nor do they care whether hair is long or short. They also only affect people – you can’t catch lice from animals. As a contagious condition that affects the scalp, it’s important to treat lice as quickly as you can. Detecting them is the first step – a fine-toothed comb will help you to establish whether you or a member of your family has caught lice. As treatment goes, there is a range of shampoos and topical solutions that can be used to kill off lice living on the scalp. It’s important to repeat this treatment regularly over the subsequent weeks, to kill any lice that may have hatched from eggs (known as ‘nits’) during this time. The scalp is often overlooked as a part of the body that needs constant care. Many of us put lots of time and effort into moisturizing our skin or keeping our hair shiny and healthy – but the scalp is equally important. Most conditions that affect the scalp cannot be transmitted from one person to another. These include dandruff, scalp psoriasis, and seborrheic dermatitis. The side-effects from these conditions can range from mild (itching and irritation) to quite serious (permanent hair loss) if they’re not addressed quickly. The main scalp condition that is contagious is tinea capitis – scalp ringworm. This fungal infection can be passed from person to person easily, and it thrives in the warm, moist conditions of the scalp. Ringworm on the scalp can cause itching, inflammation, oozing, crusting scabs and even permanent hair loss. It’s essential to seek treatment from your doctor, who will be able to prescribe an antifungal solution to fight the problem. Staph infections are also contagious. These aren’t limited to the scalp – a staph infection can occur anywhere on the body. But if you suffer from folliculitis or if you have an injury to your scalp, you could pick up a staph infection. These infections can become serious very quickly, so pay attention to any changes on your scalp and report them to your doctor accordingly. Lastly, there are head lice. Many schoolchildren suffer from these lice at some point – it’s almost like a rite of passage. These can also affect adults and can be passed between individuals with direct contact with the scalp or hair. Getting rid of lice is simple with regular treatment – and thankfully, the lice themselves don’t pose any serious threat.